IMPORTANT UPDATE 2016: there's a new Dritz zipper which is DESIGNED for knitting into garments. Somebody over at Dritz was really thinking smart! As you read the below, realize that if you had one of these new zippers, the whole project would be SO much easier, as you could pick the stitches straight up through the band, ignoring the whole knit-picking process. AMAZING!!! One downside: it seems to only come in tan, and in two lengths, but wow, what a great start on a new product. This article about installing zippers was featured in the winter 2010 issue of Interweave Knits. TECHknitting blog has had a few posts which refer to this technique, but the details have never been actually published to the internet. The copyright has now reverted to me, and TECHknitting blog is publishing all the details for the first time, complete with illustrations. There is also an accompanying video in which Knits' editor, Eunny Jang, demo's the how-to. Do you avoid making zippered knitwear because of the sewing involved? Here's a way to install zippers with no sewing at all. Instead, you literally KNIT the zipper in. To prep the zipper to perform this magic trick, we'll borrow a tool used in rug-making and machine knitting--the latch hook. 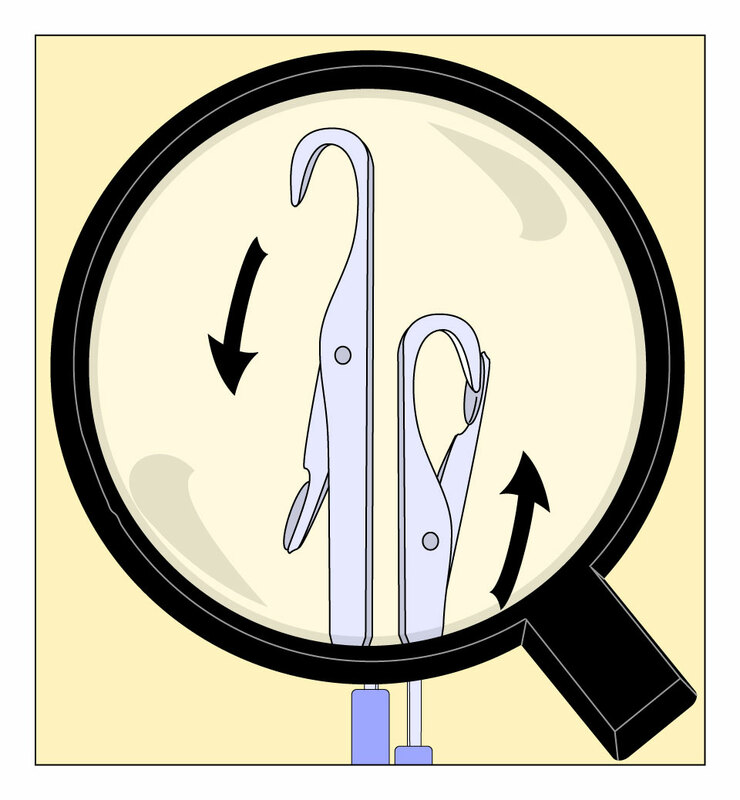 Latch hooks come in many sizes, but the one for us is a miniature version called a "knit-picker" or "snag-fixer." Available in fabric stores for a couple of bucks, these are meant for pulling snags to the inner surface of industrial knits such as polyester polo shirts. We, however, are going to use this mini-latch hook for our own hand-knitting purposes: to pull yarn loops through the fabric tape of the zipper--perfectly spaced loops which can then be picked up and knitted (or bound off). In essence, a latch hook is nothing more than a foolproof crochet hook--foolproof because the little latch can swing open to catch the yarn, then swung shut, trapping the yarn under the hook. Once the yarn is safely caught under the hook and the gate latched shut, the loaded hook can be drawn through even the tightest hole without any danger of the yarn fraying or splitting, because the latch locks the yarn in. Specifically, in our use, the latch is going to be swung open, then the hook is going to be poked through the zipper tape at a pre-marked spot, shown by red dots on the illustrations below. Next, the latch will be closed to lock the yarn onto the hook. The locked, loaded hook is then drawn through the zipper tape. 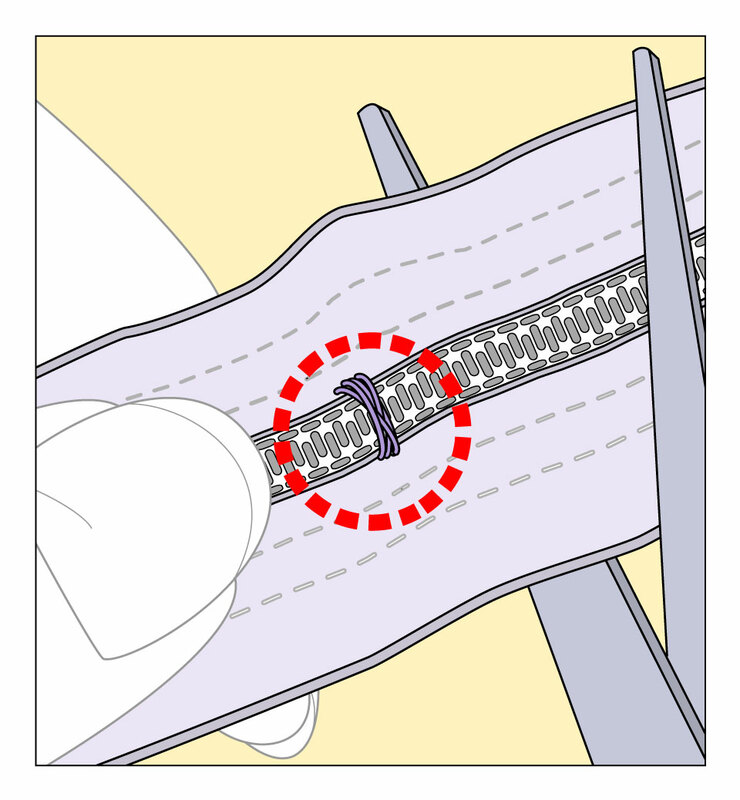 Once drawn through, the latch opens and the hook is removed, depositing the yarn loop neatly on the front of the zipper tape. As you know, any two pieces of knitting COULD be attached by sewing, but there are also NON-SEWING ways of attaching knitting together. For example, if two pieces of knitting have open (live) loops, the three needle bind-off can be used to seam them together. 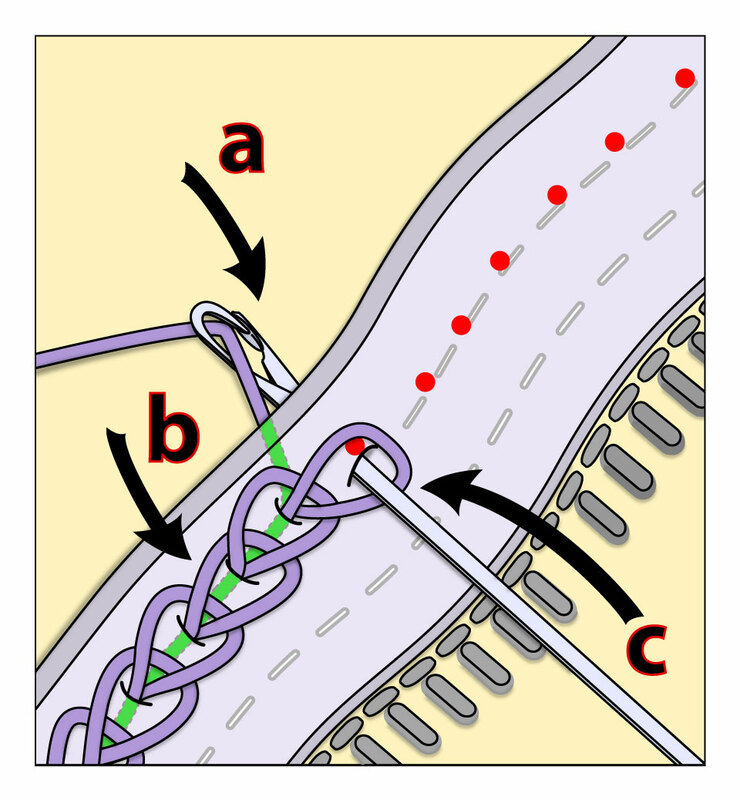 To seam together a line of open loops to a line of closed loops, or to seam together two lines of closed loops (closed loops=bind off edge, or cast-on edge, or side selvedge) you can use slip-stitching. By using the knit-picker to insert loops (open OR closed) onto the surface of the zipper tape, you're turning the zipper tape into a knit-able object. Once the zipper is knit-able, it can be seamed or attached to a piece of knitting just as easily as any other two pieces of knitting could be, with no sewing necessary. There are two basic methods for inserting loops into a zipper tape--open (live) loops or a chain of closed loops. 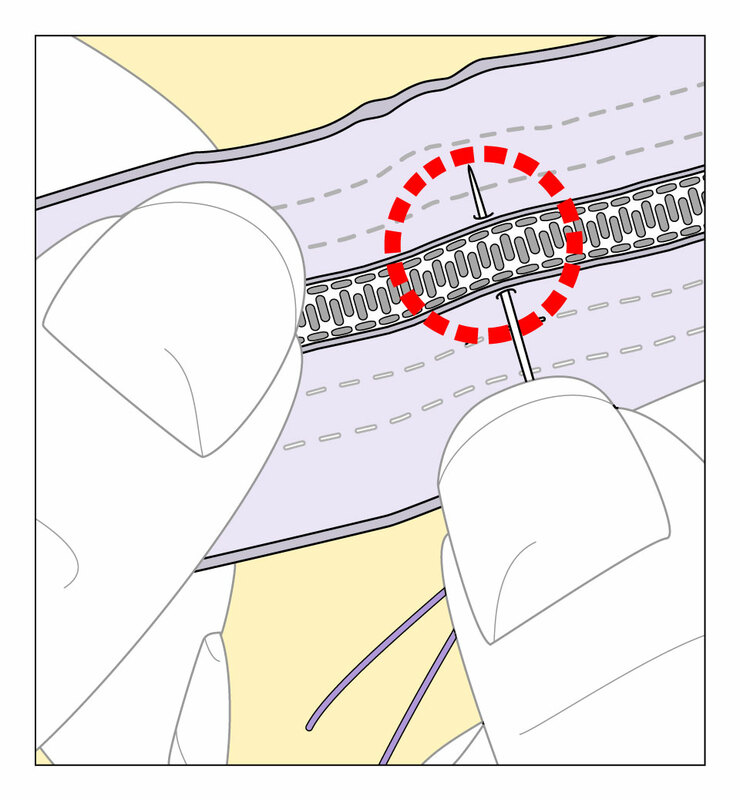 For open loops, you can simply pick up loops as you draw them through to the top surface of the zipper tape, then deposit them onto a knitting needle, as shown below. 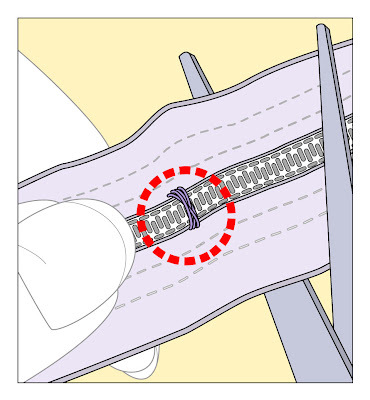 In order to get a line of closed loops (a chain of loops on the surface of the tape) you pull loops up, each through the previous loop, leaving a chain of slipped stitches on the top surface of the zipper tape. These chain stitches provide the anchor for further manipulation. 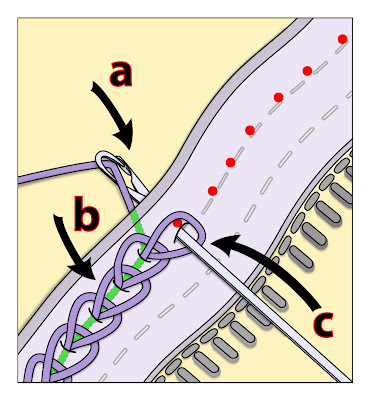 As indicated above, the open-loop method is analogous to a line of live loops, while the chain method is more like a bound-off or cast-on edge, or a side selvedge. Choose the method of drawing through loops depending on what your planned method of attachment will be. 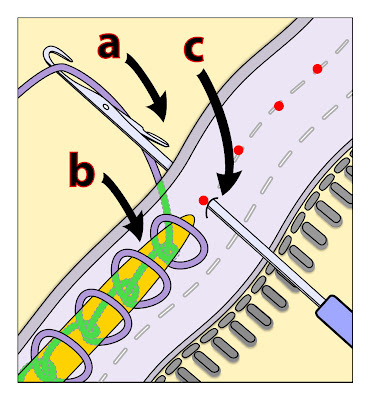 NOTE: In the illustrations above, the latch hook is not to scale: in real life the hook and latch assembly is FAR, FAR SMALLER than shown. The head of a real knit-picker is tiny! "c" indicates the method of inserting the latch hook--directly through the zipper tape, then lifted onto a knitting needle for the live loop method; or through the previous loop and the zipper tape for the closed-loop chain method. Once you determine the finished zipper length needed (more on zipper length below) you count the number of rows or stitches along the garment edge where you will install the zipper. Mark off dots, one for each loop wanted, evenly spaced. Keeping the marks in a straight line is easy. 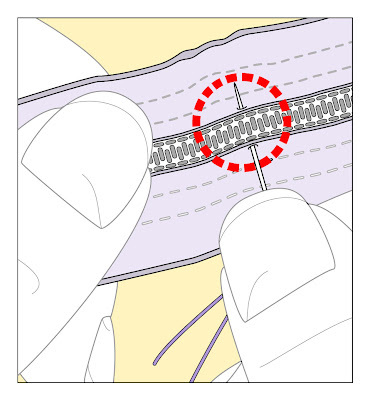 Zipper tapes are usually woven with sewing guide lines right on them--a sometimes subtle, sometimes obvious pattern running lengthwise up the tape, shown as light gray dotted lines in the illustrations. In the open (live) loop method, each loop will necessarily be the same size because they are caught around the barrel of a knitting needle. In the closed loop (chain) method, however, it is a bit more difficult. Because the barrel of the latch hook is tiny, drawing up each loop snug around the hook's barrel would over-tighten the loops. You can proceed freehand--drawing up each loop just so, as shown in the illustration, or for a more sure thing, you can temporarily insert a dpn of appropriate size into each loop as you make it, then snug up the loop over the needle barrel, then remove the dpn. This makes each loop the same size, as long as you're careful to not over-tighten the slack away as you draw up the next loop. Zippers rarely come in the exact length wanted. To shorten a non-separating (closed bottom) zipper --the kind you'd install in a purse-top, for example--shorten it by working from the bottom, as shown: First, sew a new stop. Then, snip to length. The snipped end is hidden inside the purse. For a separating zipper--the kind you would use for a sweater front, for example--you can sew a new stop at each top in a similar manner, then snip away the excess zipper tape. Alternatively, if there's only an inch or so of excess at the top, simply fold the excess zipper out of the way at a 90 degree angle to the top of the garment, then sew the excess along the garment edge with the teeth pointing down. If you cut a nylon or polyester zipper tape, consider lightly heat-sealing the edge with a match: for safety, work over a sink with the water running, just in case the tape flares. *Latch hooks take some getting used to. To control the latch's tendency to poke and tangle, use your thumb to flip and hold it it down (open) for insertion and again for yarn-catching, then snap it shut once it's loaded with yarn and before withdrawing through the zipper tape. *Because of its stiff and inflexible nature, nylon or polyester zipper tape will fold over on itself along the line of the pick-up. With use and wear, the tape will eventually soften. Washing first might soften an excessively stiff zipper tape. *Although tiny, the latch hook can pull along yarns up to and including most chunky-weights. However, the thicker the yarn pulled through the tape, the more zipper-buckling you will get. To reduce buckling, create the loops on the zipper tape using a thinner color-matched yarn: sock yarn is perfect because it is both thin and strong. Alternatively, you can catch one loop through the zipper tape for each TWO stitches wanted. This reduced buckling by halving the amount of yarn inserted into the zipper tape. With this two-for-one trick, you must double the stitch count in the next row, perhaps by inserting a backwards (or forward) loop increase alternate with each loop on the tape, or working each loop as a kfb. *Whether you are working with a closed-bottom (non-separating) zipper or a separating one, it's best to pick up stitches with the zipper opened or separated: makes the work go easier. *Poking the latch hook through a tightly-woven zipper tape goes quicker if you've used a large sharp sewing needle or small awl to pre-poke the holes. *An INGENUOUS method of poking holes and getting perfect spacing at the same time involves using a sewing machine--but not to sew the zipper in. Instead, you run the sewing machine blank (no thread) adjusting the stitch length to the gauge you want, and thus punching a line of perfectly-spaced holes in a straight line down the tape. Putting a huge (like for sewing leather) needle into the machine makes the punched hole bigger and easier to see. Thanks to reader Valsew for this tip. Coming up: Knit-pickers aren't just for adding zippers. They can be used to work in ends, also. The next post shows how.